It has been more than fifty years since the first stone of the Berlin Wall was laid in 1961, later to be torn down but today the world still seems inexorably crossed by walls, both visible and invisible. Walls that divide and exacerbate the differences, walls that feed ethnic and religious hatred, walls that raise barriers between races and skin colors; walls that create conflicts all over the world. But in this eternal, painful and hopeful story of dialogue and conflict, it is important to increase awareness that, perhaps, the walls within us are the most difficult to break down. The documentary Walls, shot mainly around the border between Nogales, Arizona, USA, and Nogales, Sonora, Mexico is the border that divides the U.S. from Mexico, the Paradise from the Hell. Along, the almost, 2000 mile border between the two countries there is a wall, a barrier of over 600 miles that has been for years a transit point for drug dealers and migrants and the scene of thousands of killings and deaths. In Mexico, the film follows a group of migrants about to illegally climb over the wall. 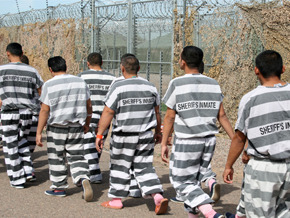 Meanwhile in Arizona, we meet a tough American sheriff in a jail for illegal immigrants. In the Arizona desert we also encounter the Minutemen, armed patriots who patrol the border, and the Samaritans, volunteers who distribute water to those migrants who have managed to cross that border. Walls, a dramatic crossroads of human destinies.